Q for glutamine. Transfer RNAs (tRNAs) are small adaptor molecules that match a nucleotide sequence to a given amino acid during protein translation. After unloading their amino acid payload, tRNAs are recharged with new amino acids through specific tRNA synthetases. Q is the official letter for the amino acid glutamine, and its respective tRNA synthetase is glutaminyl-tRNA synthetase (QARS). In a recent publication in the American Journal of Human Genetics, Zhang and colleagues identify compound heterozygous mutations in the QARS gene in two families with progressive microcephaly, neurodegeneration, and intractable, early-onset epilepsy. Interestingly, in at least two probands, the seizures are described as migrating partial seizures reminiscent of Malignant Migrating Partial Seizures of Infancy (MMPSI) due to mutations in KCNT1. The disease mechanism, however, appears to be entirely different. QARS, DARS, KARS. The current publication by Zhang and collaborators give us an interesting refresher course on basic molecular biology, particularly a section of the cellular machinery that I didn’t believe to be relevant to human genetic epilepsies – tRNAs. In humans the amino acids are attached to the tRNAs through 37 different forms of tRNA synthetases, 17 of them only present in mitochondria. The names of the tRNA synthetases is derived from the specific amino acid symbol, followed by the suffix -ARS. Amongst the various tRNA synthetases implicated in human disease, two disease-related aaRS occur in a functional complex with QARS, the multisynthetase complex. These two aaRS are KARS and DARS. The KARS gene coding for the lysine tRNA synthetase has been found to be mutated in a particular form of Charcot-Marie-Tooth disease and, separately from this, nonsyndromic hearing loss. Mutations in the DARS gene coding for the asparate tRNA synthetase cause an inherited white matter disorder with leg spasticity and hypomyelination. In their publication, Zhang and collaborators identify mutations in QARS in a phenotype consisting of intractable epilepsy and progressive microcephaly and provide supporting functional data. QARS phenotype. The authors describe two families with two affected siblings with intractable epilepsy starting in the first hours of life in 3/4 patients. All four individuals had signs of progressive neurodegeneration with loss of grey matter in the cerebral hemispheres and cerebellum. In at least two patients, the phenotype was described as migrating focal seizures, a phenotype previously described with mutations in KCNT1. The authors present the phenotype as a progressive microcephaly and not primarily as an epileptic encephalopathy. This might be slightly confusing, as the pathomechanism in the primary microcephalies is different from neurodegenerative diseases with progressive loss of neuronal tissue that leads to microcephaly. Either way, the discussion whether the phenotype should primarily be classified as an epilepsy phenotype or a microcephaly phenotype demonstrates the overlapping approaches and clinical concepts that apply to such catastrophic multisystem diseases. In addition to the epileptic encephalopathy, all four patients demonstrated profound global delay with muscular hypotonia. Two siblings also had unexplained episodes with elevation of creatine kinase levels and agitation associated with a paradoxical reduction of seizures. The seizures were reported as polymorphic clonic and generalized tonic-clonic seizures as well as prolonged apnoe spells. Related phenotypes. The authors point out the somewhat related phenotype of pontocerebellar hypoplasia (PCH), a progressive microcephaly with predominant atrophy of the pons and brain stem. PCH is genetically heterogeneous, but often due to mutations in TSEN genes, such as TSEN54, TSEN2 and TSEN34. These genes code for tRNA splicing endonucleases, proteins that are involved in the formation of mature tRNA. Other genes for PCH are RARS2, coding for a mitochondrial aminoacyl tRNA synthetase and SEPSECS, also involved in tRNA synthesis. This points towards a common pathomechanism resulting from tRNA defects in neurological phenotypes characterized by primary hypoplasia with subsequent neurodegeneration. QARS and epilepsy. On a more conceptual level, it is remarkable that mutations in very essential cellular processes such as tRNA metabolism lead to an extremely severe epilepsy phenotype that accompanies the neurodegenerative phenotype. This may indicate that particular neurons may be especially vulnerable to tRNA synthesis defects, creating a very early imbalance between excitation and inhibition. Lessons learned. The phenotype of QARS mutations has shown an unexpected link between the epileptic encephalopathies and disorders within the framework of the pontocerebellar hypoplasias, highlighting defects in tRNA processing as a novel causative mechanism in catastrophic epilepsies. 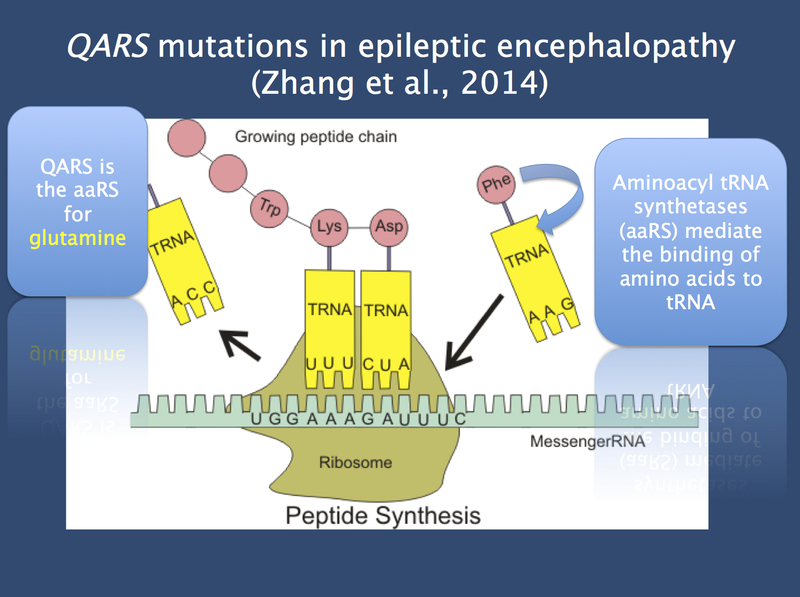 Given the phenotypic range of other aaRS mutations, future studies will demonstrate whether other epileptic encephalopathies may also be due to mutations in this gene or related candidates. This entry was posted in 2014, Epileptic encephalopathy, Publications and tagged aaRS, Charcot-Marie-Tooth disease, DARS, glutaminyl-tRNA synthetase, KARS, KCNT1, Malignant Migrating Partial Seizures of Infancy, MMPSI, neurodegeneration, PCH, pontocerebellar hypoplasia, progressive microcephaly, QARS, RARS2, SEPSECS, tRNA, tRNA synthetases, TSEN2, TSEN34, TSEN54, WDR62. Bookmark the permalink.